Green Lake is the nearest fishing hole/green space/park/people watching area/escape to our house. There was a 5k race around it last weekend. It was sponsored by a doughnut shop. I was running out of excuses (punny huh?) of why we shouldn’t do it. I had no idea how I would do since I haven’t raced since…. wow. 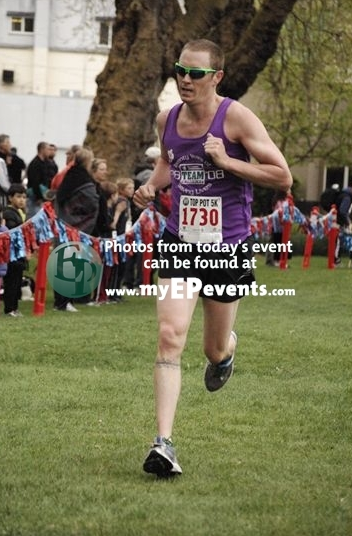 I don’t really remember my last running race. I guess it would be Bolder Boulder 2010. I have done a couple of cyclocross races, but it sure has been a while. Bolder Boulder results from a couple of years ago. So, I had no idea what to expect. We lined up according to our pace. I figured that I would be in the 7-8 minutes per mile. Standing there, I was between the mom with a stroller and the guy in jeans with a headband on. I casually moved up. At the 7 minute pace there were a couple of kids that looked to be about 12 years old. The 65 years old trio was chit chatting beside them. Two of them thought that their buddy was going to be really fast today. They asked what his finish time would be and he said that he had no idea. He seemed surprised that people would have any sort of estimate of how long it would take them to run three miles. I snuck in front of them as well. That put me beside the group of guys wearing matching running singlets and very small shorts. I knew that they were serious runner. Feeling cocky, I hung with them for what felt like all morning, but was probably closer to a quarter mile. Maybe a half mile because I felt like a hero. I paid for that. We were probably running a 5:30 pace. After mile 1 I tried not fall over, puke, cry, or give up. I felt like doing most of those things. A pack of 4 girls passed me before the sign for mile 2, but they gave me the demotivation to keep up a brisk pace. I finished with a time of 19:41. I was stoked. i didn’t think that I would be able to run a sub 20 minute 5k. 2012 Top Pot 5k result. What is interesting is that the level of running is amazing here. I was 14th in my age group of the Bolder Boulder, but 19th here! The saddest part of the story is that I have been so sore al week that I might try running again next week. Thanks to Super Jock N Jill, and Top Pot! This entry was posted in race and tagged doughnut, Green Lake, race, running, Seattle, wwwp5k by Rory. Bookmark the permalink. Try it again, April 28, 2013!